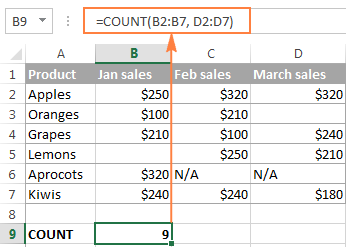 This short tutorial explains the basics of the Excel COUNT and COUNTA functions and shows a few examples of using a count formula in Excel. You will also learn how to use the COUNTIF and COUNTIFS functions to count cells that meet one or more criteria. As everyone knows, Excel is all about storing and crunching numbers. However, apart from calculating values, you may also need to count cells with values - with any value, or with specific value types. For example, you may want a quick count of all items in a list, or the total of inventory numbers in a selected range. Microsoft Excel provides a couple of special functions for counting cells: COUNT and COUNTA. Both all very straightforward and easy-to-use. So let's take a quick look at these essential functions first, and then I will show you a few Excel formulas to count cells that meet certain condition(s), and clue you in on the quirks in counting some value types. You use the COUNT function in Excel to count the number of cells that contain numerical values. Where value1, value2, etc. are cell references or ranges within which you want to count cells with numbers. In the modern versions of Excel 2016, Excel 2013, Excel 2010, and Excel 2007, the COUNT function accepts up to 255 arguments. In earlier Excel versions, you can supply up to 30 'values'. Note. In the internal Excel system, dates are stored as serial numbers and therefore the Excel COUNT function counts dates and times as well. Below are the two simple rules by which the Excel COUNT function works. If an argument(s) of an Excel Count formula is a cell reference or range, only numbers, dates and times are counted. Blanks cells and cells containing anything but a numeric value are ignored. If you type values directly into the Excel COUNT arguments, the following values are counted: numbers, dates, times, Boolean values of TRUE and FALSE, and text representation of numbers (i.e. a number enclosed in quotation marks like "5"). For example, the following COUNT formula returns 4, because the following values are counted: 1, "2", 1/1/2016, and TRUE. 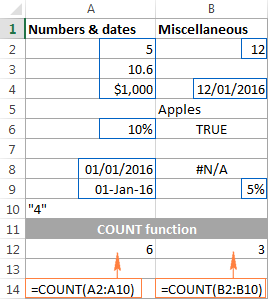 And here are a few more examples of using the COUNT function in Excel on different values. If you want to count numbers that meet certain criteria, use either the COUNTIF or COUNTIFS function. If apart from numbers, you also want to count cells with text, logical values and errors, use the COUNTA function, which leads us right to the next section of this tutorial. 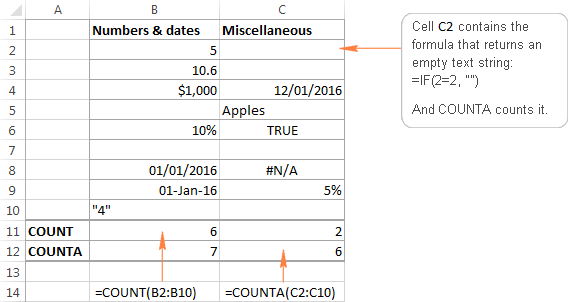 The COUNTA function in Excel counts the number of cells in a range that are not empty. Where value1, value2, etc. are cell references or ranges where you want to count non-blank cells. As you can see, the ranges supplied to an Excel COUNTA formula do not necessarily need to be of the same size, i.e. each range may contain a different number of rows and columns. In some cases, you may be perplexed by the COUNTA function's result because it differs from what you see with your own eyes. The point is that an Excel COUNTA formula may count cells that visually look empty, but technically they are not. For example, if you accidentally type a space in a cell, that cell will be counted. Or, if a cell contains some formula that returns an empty string, that cell will be counted as well. In other words, the only cells that the COUNTA function does not count are absolutely empty cells. In the first argument, you define a range where you want to count cells. And in the second parameter, you specify a condition that should be met. The COUNTIFS function was introduced in Excel 2007 and is available in all later versions of Excel 2010, 2013, and 2016. 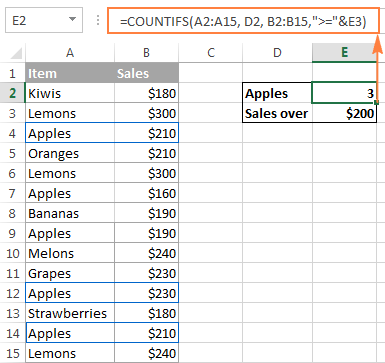 You will find plenty more formula examples here: How to use Excel COUNTIFS function with multiple criteria. Well, this is how you use the Excel COUNT and COUNTA functions. Like I said, they are very straightforward and you are unlikely to run into any difficulty when using your count formula in Excel. If someone knows and is willing to share some interesting tips on to how to count cells in Excel, your comments will be greatly appreciated. I thank you for reading and hope to see you on our blog next week! 85 Responses to "Excel COUNT and COUNTA functions to count cells"
how can we use "if" function when there is either text or number in cell..
if the cell contain text then answer should be "Yes" or else the cell contain number then answer shold come "No"
if we click on Division the Divison will show then after clicking on Zone the zone and clicking on the specific zone the zones area will reflect with HQ automatically. I was Searching this topic since 3 weeks Now i Found in this articular Thanks a lot. its working in Drop Down list active Words. That was no issue . has sombody a idea how to handle it ? I want to count enteries in a column and then multiple the number of entries by a set number. In other words, I have a spreadsheet, where different columns have different values. IF an entry is made in column A, it should be counted as 1 entry. But the value of second column is double and that of third is x 5. So I want to be able to count the number of entries in a particular column and then multiply it by 2/5/10. Whats the best formula for this? I am using this formula =IF(MAX($A$4:A263)=SUMPRODUCT(1/COUNTIF($B$5:B264,$B$5:B264)),"",(SUMPRODUCT(1/COUNTIF($B$5:B264,$B$5:B264)))) For Serial Number but it shows the sr no after missed some columns. whereas the sr. number column should be nill until the next particular not comes. Each of these only work with one word at a time, but all of the combinations for "A" need to be tracked in a column (A3) for example. "B" would tracked in A4 and "C" would be tracked in A5 and so on. If B and ACV were in their respective columns (Say E5 and G5)on one sheet, then those 2 numbers would be tracked on another sheet on A3 as a number. I hope this explains it well enough, thank you. I found the solution, disregard, thank you. what formula use in it. I am trying to use countifs to count no of cell which meet multiple criteria where each criteria has got different no fo rows and column compare to other. i want to count no of cell from column D,E and F if value in column A is equal to X.
Ok guys/girls i'm pulling my hair out with this formula, i'm fairly confident the problem is in the two cells with times in. cells h50:h5000 have two times combined in a cell with - as a division, all i need is the second part but using 'right' function doesn't appear to work as part of a larger countifs. these cells are imported and can be 1000's of rows long so creating another column to separate is awkward. The formula by itself (ctrl, shift, enter) appears to work fine but I require the other criteria. Hi, i have a certain name (wilium) in column A and against this name i have 2 option, 1 Done and 2 Inprogress. i want that i count done again wilium and count inprogress against wilium separately. which formula will work for it?? I have data with family includes Self, spouse, children, parents. i want separate count of how many single child family and how may 2 children family are there in data. if column A is X and column C is X, Y and Z. Do you also have a tutorial on COUNT and COUNTA in Google Sheets? Svetlana - thank you for your blog. Your help on an array three years ago helped me greatly on my project. I have a new COUNTIF question. I have a file with 9895 rows of mailing information. The zip codes are either 5-digits or zip+4. I'm trying to count the number of zip codes in a few categories: 1) Number of 5-digit zip codes (I wrote that formula fine); 2) Number of zip codes that BEGIN with THREE specific numbers and DO NOT include any of the 5-digit zip codes I already counted. I can't seem to write a formula or array that gets me to the correct answer. I don't want to count any zip codes that INCLUDE the three specific numbers if they are NOT the first three numbers. I've used LEFT for a few formulas, but now I can't seem to eliminate those zip codes where the specific string is INSIDE the zip code, not the first three characters in the cell. Should the column of zip codes be a number or text? Here's my array attempt at counting: =SUM((LEN(LABELS!$B$2:$B$10000)-LEN(SUBSTITUTE(LABELS!$B$2:$B$9896,"958","")))/LEN("958"))-G2-G3-G4-G7-G8-G9-G10-G11-G12 that I thought searches for zip codes that begin with "958" and subtracts the 5-digit searches I already completed, but it's returning a count with the "958" included in the zip. Any thoughts? For Example: I have in Column range from B5 to B20 and B5, B6, B7, are with numerical data, and B8, B9 are blank, B10,B11 again with data. I want to have a formula which counts all the cells from B5 to the last active column which is B11 and the answer should be 7 for this – which is by counting all the way from B5 to B11. Many thanks. I have a column that has different cities in each cell some have just one city and some have Multiple destinations: city1, city2, city3. These cities overlap. Is there a function I can use to count all of "city 1"? I have tried =COUNTIF(F4:F29,"City 1 name") but it does not count the ones with multiple cities. Thank you so much for your reply, really appreciate it. I tried the formula but it doesnt give me what am looking for. This is the summary of the formula i need. discount of $37.9/MT for every pound below 49lbs to 47lbs. And discount of $75.8/MT below 47lbs to 46lbs and rejection for outturn below 46lbs. Discount of $5/MT for every nut above 210 to 215, and above 215 to be rejected. Discount of $20/MT for every 1% above 10% to 12% above 12% to be rejected. please i need this formula assistance. Thank you. So imagine Sheet 1 B2 having the results already, I now wanted to count either A, B, or C in Sheet 2 if it EXACTLY matches the name I'm looking for in Sheet 1 A1. 1. How to count cells in a row with certain color/s (I use only 2 colors) and return the result in another tab (summary). 2. How to make sure that additional rows in a sheet are counted? I can't highlight the whole column (as range) as I include notes at the bottom of the working area. 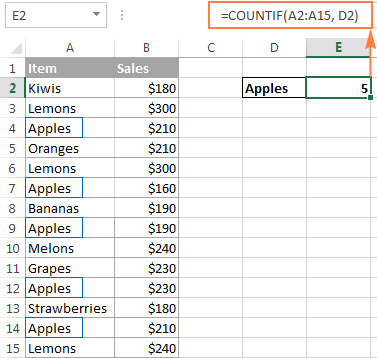 At the moment, I specify a range but when my list goes beyond the range, and I forget to update the formula, I miss the additional rows and my count is wrong. 2 Perhaps, you could extend the range in the formula, but I'm not entirely sure whether you need all the cells from additional range to count or only some of them. And if only some of them, how you decide which ones? How to use countifs function in I have sevaral answers in one column that will be counted? More precisely, if I want to count only "Yes" answers from one column and "Yes, always" and "Yes, sometimes" answers from another. Im trying to create a formula that counts yes and no without counting them more than once. The yes can apply to the same person but only need to count it once. I am trying to find the numbers of people from different districts, I have set all the details of people giving cascading options but in the analysis part, I want the numbers of districts chosen by the data collector, is there any particular formula? so that I can get these numbers of people were from this district and these from another district. How to be call apple/oranges in one column..! If in one cell we will add 14 no e.g. =12+12+15+16+16....than by which formula we can count total entered now ie 14 no?? If in one cell we will add 14 no e.g. =12+12+15+16+16....than by which formula we can count total entered no ie 14 no?? I am try to write a formula that calculates a range of cells if a second range of cells contains a specific word. Can you help me in writing this formula. Is there a way to count sequential cells using COUNT A? 1+2+3+4. this is A Column Values. I need the Value of Total is B column. I need the Value of Total in B column. I have a excel spreadsheet of members of a club I am running, the spreadsheet contains members details each member has a unique reference number ie, 1243199 etc etc, the members may then have joined more than one group within the club. I need to be able to show how many members are members of either 1, 2, 3, 4, 5, 6, or 7 groups. Without having your data in front of me I would say if you select the cells that contain the data you want to analyze and then click Insert/Table you can format the data into a table that you can quickly and easily sort and filter by member or club or whatever information is in the table. piece of information, go ahead and create headers before you create the table. It makes things much easier to work with. Depending on the number of members in your club, it might also be easy to create a Pivot Table to analyze this. Base your Pivot Table on a table and the changes in the table will be reflected automatically in the Pivot Table. There is a good explanation of Pivot Tables here on AbleBits. Just type "Pivot Table" in the search box and you'll see the link to Pivot Table for Beginners article. I have a spreadsheet where patients are admitted at a certain time then discharged a certain time. I need a formula to count the number of patients that are in ER during a 1 hour time. In Column B I have the Admission time and in Column C I have the Discharge time. If I have 33 pts admitted at different hours throughout the day, I would like a formula to count the number of patients that are in ER at 5:00 then at 6:00 then at 7:00 and so on. Below is the table I have. With manual counting I have 2 pts in ER at 5:00, 4 patients in ER at 6:00 and so one. Is there a formula for this. If you want to count the number of patients admitted during a particular hour this is how I would do it. To the right of this data add three columns. The first in D1 is labeled Admin Time, the second in E1 is labeled Sum of Admin Time and the third is in F1 and is labeled Time Wanted. Clearly you can label them as you see fit. In D2 enter =MROUND(B2,"1:00") this will produce 5:00 using your first sample. In F2 enter the time period you're looking to count. So, you're telling Excel to look in the range D2 thru D35 for the value in F2. In the formula the F2 address is locked. The cells holding the time should be formatted in the same type. I used Time 1:30PM for my practice sheet. This allowed me to quickly distinguish between AM and PM times. I hope this works for you. Let me know if there's something else. The formula is not counting what I need it to count, what am I doing wrong? Are the cells formatted incorrectly? Please help me with this problem. I would like to highlight all rows where the Name and Date column values match AND the Procedures listed on the same date definitely has 921 listed and also has either 992, 993, 994 or a combination of these procedures listed on the same date (Each procedure is listed once in the row, so if they have 921 and 922 on one date that will be two rows). So for each matching name and date there will be at least two rows highlighted. Thank you so much! We've received your sample table and replied to you by email. Please check your inbox. I guess the easiest way to do what you want is to use the functions COUNTIF and COUNTA. the percentage is derived by D4/D5 and format the cell as percentage. This was VERY helpful. I had to do a little fine tuning, but it gets the job done. Thanks so much. I want to count for example how many times "L1/2" appears in the range A1:A238. When I use the function =COUNTIF(A1:A238, "L1/2") it gives me the answer two, but I think it is only counting cells that contain only "L1/2" and not perhaps those that contain "L1/2, L2/3, L3/4". As you have discovered COUNTIF will not work in this situation. Instead, you'll need to use SUMPRODUCT, ISNUMBER and FIND or SEARCH. SEARCH is not case sensitive, FIND is case sensitive and both will return a position which ISNUMBER returns as a hit and then SUMPRODUCT returns as the sum of the hits. Please help me how to make a formula to count sales item of each date that how much quantity of nokia mobiles sales in date 1 or date 2 so it will automatically count. for those names that fall under P:P may not match F4 exactly, because of an initial in the name, how would I write this to count if name is similar when looking up on different tab? and in C1 I gave "6" and in C2 I gave "9"
In D2 I give the formula that gets me the result "6" that is the position of 9 from the digit 6 is 6 counting from the row which contains the value equal to C1 i.e. "6" in Column "A" and that is the beginning of the count then it counts upward and if the value equivalent to the cell C2 i.e. "9" is not fount then it continues from the bottom i.e. cell "A9" which has the value 1 in it and reaches the cell "A7" that contains the value 9 but either of the one should be excluded from the final count and state me the result i.e. "6". Which formula can I use here and what are the arguments or options in MS Excel fir this? And also if I give 2 it should get the value of the cell which is second in upward counting of rows from the previous cell value that equals a value in a range..
May be simple answer to this but still finding my feet in excel. the list is often hundreds long. What I need to do is generate separate counts for todays date, yesterdays date up to 5 days previous. The list is updated daily but always in the same format. found a work around. I used the text to columns function in the Data tab. seems to work. If there is a better way would still appreciate the help. I am trying to add the total number of hours I have worked, out of a grand total (in this example 75 hours). Can I display the sum to read, for example, 48/75 to represent 48 hours of the total 75 hours needed? I am on Sheet2, looking for number of count of more than 80% from Sheet1. In Sheet1 there is coloum matching for "product" , "date" & "percentage". In the Sheet2 item matching from date & product. Can you please suggest me What formula I need to use to get the answer? Hi. How do I add a string of text behind a formula? I am trying to count a column and add the words behind it for the report.